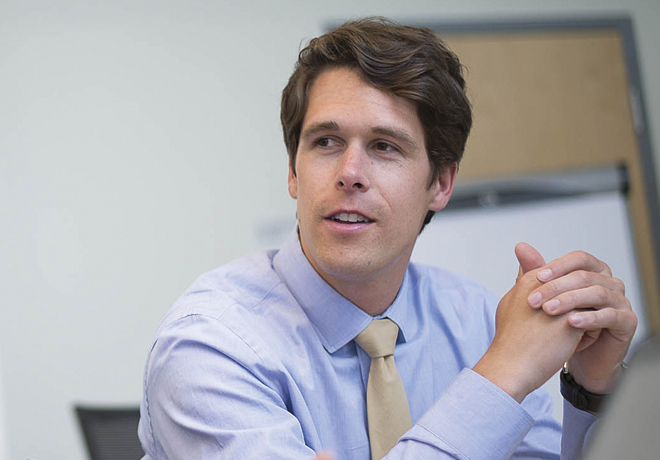 J.J. Reidy was not your prototypical MBA student, and he’s not afraid to admit it. “I’m an unconventional kind of guy,” says Reidy, a graduate of the Johns Hopkins Carey Business School’s Global MBA program. As an undergraduate at Denison University, Reidy studied History with a concentration in East Asian Philosophy. He wrote his college thesis on Meriwether Lewis, speaks both Spanish and Italian, and once spent a summer living in a 1970’s era school bus while working as a farmhand in Vermont. So when Reidy was looking into Master’s programs, he knew a conventional MBA program was not going to be the right fit. Enter the Johns Hopkins Carey Business School. Reidy said he was drawn to the school’s mission to teach “business with humanity in mind,” a credo that drives the school’s socially-conscious faculty, curriculum, and student body. Reidy ended up leaving a job at LivingSocial, a Washington-based startup he joined three years earlier, to enroll at Carey. Reidy’s student experience at Hopkins allowed him to accelerate a passion project into a start-up called Urban Pastoral Collective. The start-up’s goal is to become Baltimore’s first commercial-scale urban farming operation using innovative technology like hydroponics, aquaponics and vertical growing. He said the company has received some seed funding from Johns Hopkins Technology Ventures and is set to begin its first growing operation sometime this year (or by the summer). And its progress would not have been possible without Carey, Reidy says. “I looked at this school as a two-year incubator for my business concept, and it’s worked out pretty amazingly,” Reidy said. For starters, he met his two business partners while classmates at Carey. Julie Bisson, Urban Pastoral’s chief design officer, is a graduate of Carey’s MA/MBA in Design Leadership, a collaborative program with MICA. Mark Verdecia, Urban Pastoral’s chief scientist, is a former NIH scientist who is currently an MBA candidate at Carey. Reidy said Carey’s innovative curriculum has empowered his entrepreneurship. He specifically cited two classes: Innovation for Humanity and CityLab. Innovation for Humanity, or I4H, is the Global MBA’s signature course. Students are divided into small teams and tasked with using their business acumen to address a real-world problem facing an organization in a developing country. The course centers on a three-week trip to the country where the students work side by side with the organization’s leaders to implement their plan. CityLab, taught by associate professor Lindsay Thompson, is a practicum course that immerses students in the social and economic issues facing challenged Baltimore City neighborhoods. For the course, students work with various stakeholders – community members, city officials, etc. – to implement catalysts for change in these downtrodden areas. These classes contribute to Carey’s unique curriculum, which includes a mix of traditional business school courses, courses that encourage hands-on learning, and courses that bring in business professionals to lecture. Reidy said, for him, the curriculum style contributes to Carey’s entrepreneurial and socially conscious culture. And when you add in the various connections and crossovers to the various other Johns Hopkins institutions, what you get is a very unique structure.